two Pentium III. computers running the Java chatbot softwares, and the director applications which turn the textual conversation to spoken sentences. mounting steel cables, accessories etc. The two computers running the robots are exchanging the textual messages via an ethernet based local network. 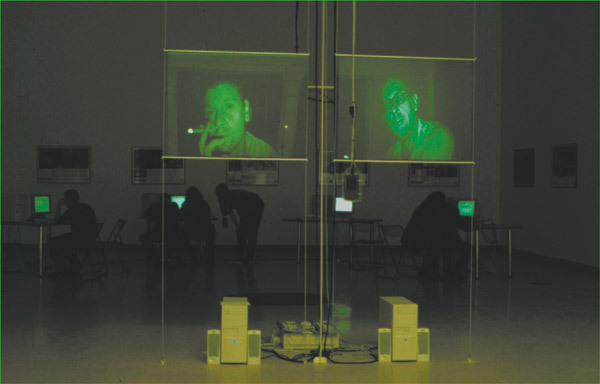 Their operating system is windows 2000, the two custom-made softwares running on them are the Java chatbot software, and a director application "translating" the textual conversation by playing pre-recorded short videos corresponding to the words of the robots' replies. The communication is based on TCP/IP, the Java chatbots are providing a virtual webserver with several dedicated ports for interchanging commands and the sentences of the conversation. The user interface is a small palm computer running Windows CE 3.0 and Internet Explorer. The visitors can select leading sentences for the robots to chat about on a rolodex-like webpage. The webpage itself is located on a third computer, running Linux, which is used for timing and controlling the robots.